, : Put target creature on the bottom of its owner's library. 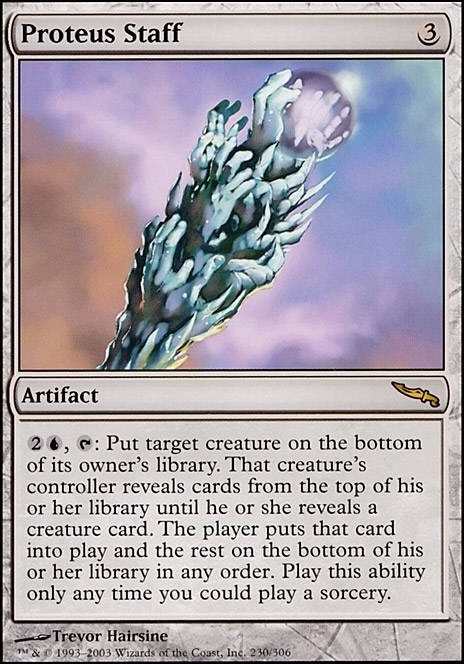 That creature's controller reveals cards from the top of his or her library until he or she reveals a creature card. The player puts that card into play and the rest on the bottom of his or her library in any order. Play this ability only any time you could play a sorcery. You're totally right. I love Feldon of the Third Path . I recently have been changing the deck list to be more accommodating for cheating creatures in so I tried lowering the creature count to help with cards like Proteus Staff . 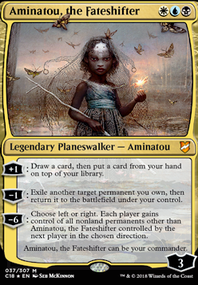 I've never had a good chance to use Phyrexian Processor but I can't wait for the chance. 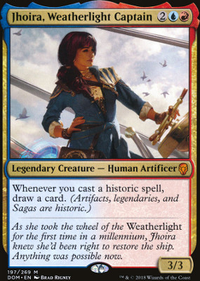 Well, the problem with using a different commander is that you have to tutor both pieces, or use tokens and activate Proteus Staff twice. Both slow the combo down significantly. 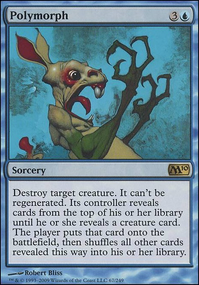 One thing to note: When Fblthp, the Lost becomes targeted by Proteus Staff its trigger to be shuffled into the library will resolve first, thus will not be placed on the bottom of your library. You will still resolve the staff's ability to reveal cards until you reveal a creature, and if Fblthp is that creature you will get the two cards, but you will not be able to reorder your entire library as it has been suggested. Only those cards revealed by that staff's ability will be reordered and placed on the bottom of your library. Proteus Staff could be copies 5-8 of Polymorph . In order for the Proteus Staff combo to function, the deck itself must be creatureless. This means that cards such as Trophy Mage and Laboratory Maniac cannot be played in the 99. Furthermore, on its surface, the new Jace does have some appeal for a deck like this. However, it would be more or less a dead card outside of the combo and have little impact at any other point in the game. USZ and Double Scepter win conditions are favorable in this regard because they are not necessarily dead draws and they feel more efficient than the new Jace. Long-Term Plans feels a little too slow unless we have a Brainstorm or another card that digs at least three cards deep. For that I think it's too slow and too conditional. 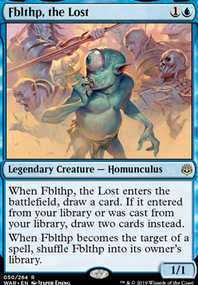 So, with Fblthp, the Lost as your commander, no other creatures in your deck, and a lot of artifact tutors to search for Proteus Staff , one activation would put Fblthp on the bottom of your library, then cheat him back out for two cards. 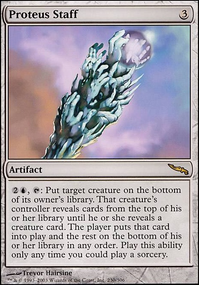 BUT, before the draw, if I understand correctly, you would be allowed to order your deck IN ANY ORDER YOU WANT because of the wording on Proteus Staff . I'm not really a cEDH player, but I feel like this could be really strong. 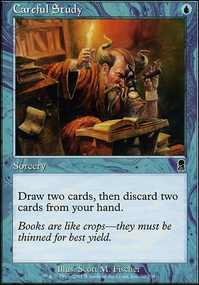 You basically tutor two cards, every turn for . With mana rocks and Paradox Engine , this could just make a frightening deck, what do you think?